Just unpack your bags & move right in. 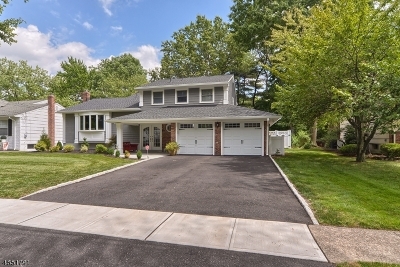 This 4 bedroom Split is in the desirable Woodside Estates neighborhood. Enjoy a fully modern kitchen that includes granite counters, custom cabinets, separate cooling & freezer drawers (in addition to refrigerator) & an extra wide 7.5' center island. A Master w/walk-in closet. Recent updates: roof (w/plywood), vinyl siding, portico w/bluestone slate porch, driveway, LR bow window, gutters & leaders, garage doors, exterior lights and security system. There are 3 sets of French doors leading to patio & park-like professionally landscaped yard - enclosed by new vinyl privacy fence. 2 car garage w/interior access & driveway space for 4 cars. Great Location: Just minutes from all schools, NYC bus, jitney to train, houses of worship, shopping & major NJ highways.